In 1865, the United States Mint began producing nickel coins for the first time. Unlike the five cent coin that we know today, these had a value of three cents. 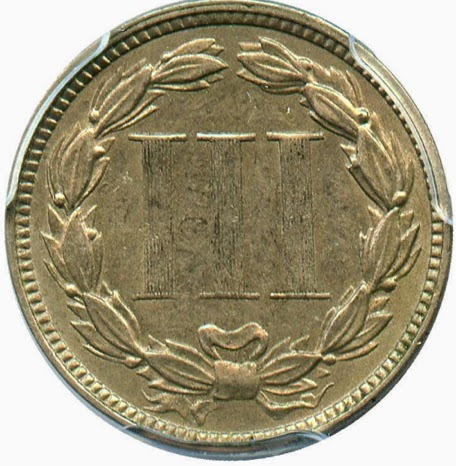 A first class postage stamp was three cents and that's what is often mentioned in conjunction with this coin. It's right to do so as that was a reason for choosing this denomination. The choice of nickel was because silver coins and copper cents had pretty much disappeared from circulation due to hoarding. Nickel is also harder and will last longer in circulation, though it did not hurt that the owner of a major nickel producing mine had deep political connections. But leaving it there misses something important. We think of a postage stamp as something of little value, but three cents was not unimportant in 1865. A carpenter might have earned a dollar a day then, a farm worker would earn 30 cents or so - that three cent postage stamp may not have been a luxury but it certainly wasn't cheap! And yes, people did call these nickels, although the 5 cent nickel came out in 1867, confusing that name. 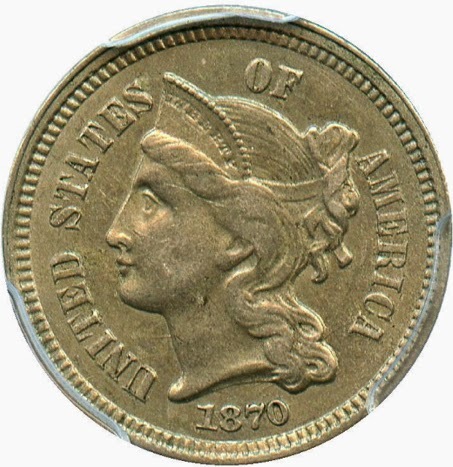 Coinage of three cent nickels ended in 1889. Interestingly, a bill by Congressman R.J. Bulkley was introduced in 1912 to resurrect this denomination and possibly a half cent also. You can read all about that at Coinage of a Three-cent Piece United States Congress House Committee on Coinage, Weights, and Measures - January 1, 1912. In the first place it is believed that a great many articles are sold arbitrarily for 5 cents which could go for 3 cents if there were a convenient coin. Perhaps the most important example is in restaurant prices. Almost everything on the restaurant price list is a multiple of a nickel, yet in spite of that there are in the big cities a good many 3-cent lunches, in spite of the inconvenience of handling the pennies. I believe such a scale of prices would be appre ciably promoted by the existence of the 3-cent piece. I believe it would be a matter of convenience to merchants in making change, and, in some cases at least, would tend to cut down prices which are ordinarily given only in multiples of nickels. Certain newspapers, particularly morning papers, which are unable to sell for 1 cent, are now obliged to get 5 cents because there is no convenient coin that the newsboys can handle. I have no doubt it would be a convenience to a good many newspapers, and that some of them that sell for a nickel would be glad to sell for 3 cents, if there were any convenient way of handling the change. The most important use of the 3-cent piece from my point of view, I am frank to say, is in payment of street-car fares. The city of Cleveland now has a universal 3-cent fare, and I believe it has come to stay, and 1 have brought a copy of the franchise here in case anybody wishes to look it over. The proposal was for coins with a center hole to help distinguish them from other circulating coins. I see a similarity between these and the V nickel no cent coin that came out. Interesting. Definitely. Patterns show that. See J-633 Pattern for example.